Because you have shown us some love, we would like to give you a Hoxton mini hug in a postcard. Because you have shown us some extra love, we would like to give you a Big Hoxton Hug in a postcard. Because you have shown us some larger love, we would like to give you a Hoxton Bear Hug in a postcard. Because you have shown us this much love, we would like to give you a Hoxton Group Hug in a postcard. Because you have shown us so much love, we will give you a shout out on social media so that all our friends know just how wonderful you are. Because you have shown us this much love, you, or if you are a corporate giver, one of your employees, can come along and work for a day in our extraordinary workplace with our extraordinary people. We know that a job can change people’s lives and the lives of those around them. And we believe that everyone should have that opportunity. 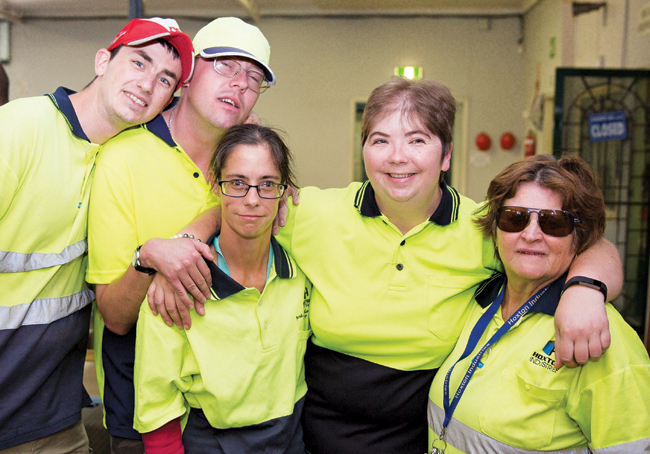 We employ more than 100 people who face barriers to mainstream employment including people living with disability, the long term unemployed and older workers. We know our solution is working because we have been changing people’s lives through employment since 1969. Hoxton started when a small group of people banded together and worked long and hard to raise funds and lobby the local council – and they created a place where people living with disability could find meaningful employment in a caring, supportive environment. From these beginnings we have grown and expanded our employment solutions to include people who face other barriers to mainstream employment. Our aim is to be around for a long time so that many more people have the opportunity to transform their lives – not just by having a job, but also through the many far-reaching social, economic and health impacts having that job brings. Just for now, though, we want to raise enough funds to purchase a new forklift for our warehouse. A new forklift will help to keep the receiving and dispatch of work running efficiently – and the more efficient we are, the closer we get to our long term goal. Many thanks to the following Hoxton employees and families who have already donated; Joanne L, Nethal T, Elizabeth P, Bill W, Michael B, Brian and Julie Y, Mrs Caruana and Vikki T.